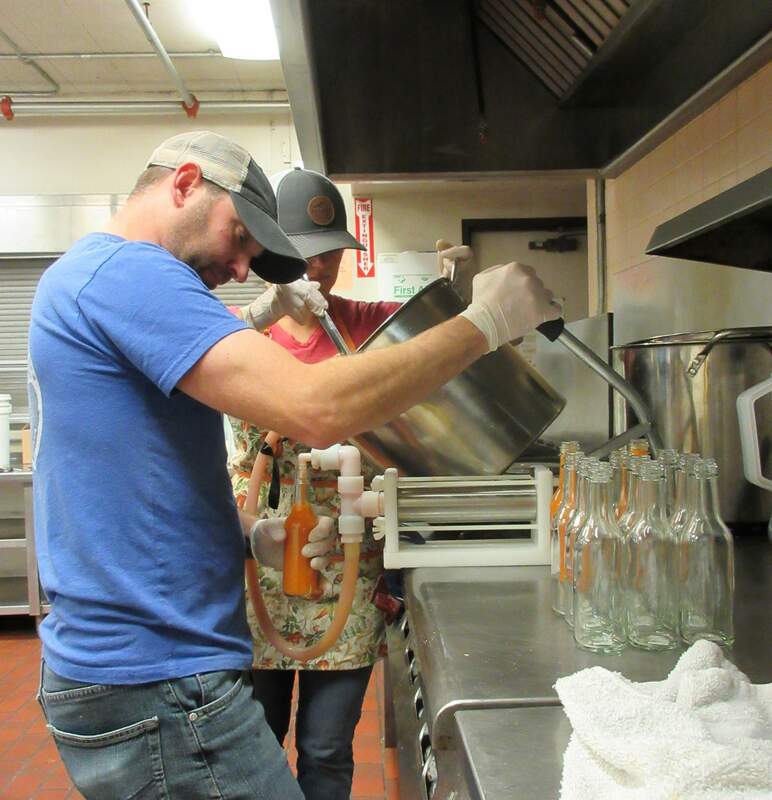 Mark Grubis bottles Durango Artisan Foods’ habañero sauce as his wife Kara assists with capping the bottles Sunday at the kitchen at La Plata County Fairgrounds. The couple started their company after being inspired by the hot sauces they encountered on a trip to the Caribbean. 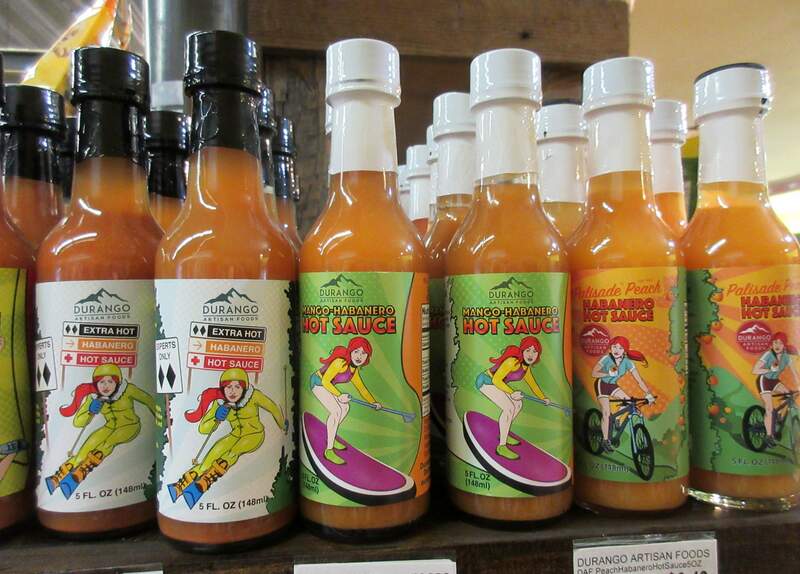 Durango Artisan Foods products are sold at several locations around Durango, including Durango Natural Foods, as well as on the company’s website. When Mark Grubis semi-retired from his aerospace engineering career, he found a new interest. He and his wife, Kara Grubis, also an aerospace engineer, would often travel to the Caribbean (they got married there, too). They fell in love with the sweet and spicy flavors of the region – flavors they couldn’t find in their local grocery store – so Mark decided to replicate them himself. “The actual flavors of the vegetables and peppers came through the vinegar (in the hot sauces) and it enhanced the flavors of the meals. It wasn’t just added heat.” Mark said. His first creation was a habañero hot sauce inspired by that idea. Mark and Kara gave their family and friends the homemade hot sauce before deciding to turn it into a business. Mark, with marketing and photography help from Kara, who is still a full-time engineer, launched Durango Artisan Foods in January. 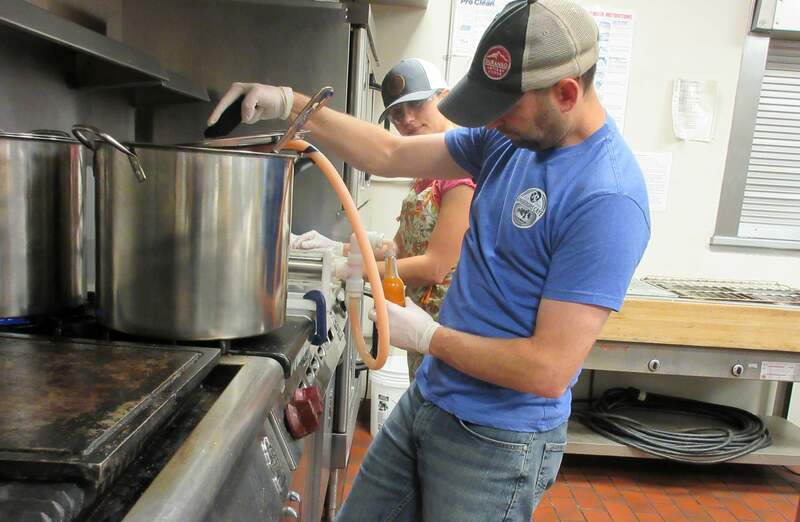 They currently rent the kitchen at the La Plata County Fairgrounds, where they make and package five hot sauces, including mango habañero and Palisade peach habañero, 16 spice blends and other condiments, all between $4 and $15. Mark doesn’t have formal culinary training, but his engineering mind has been helpful with his trial-and-error methodology. He continuously reworks and remeasures each recipe. “He does it very scientifically and methodically,” Kara said. She is the taste-tester and the one to let Mark know when he’s done experimenting. “Usually, it’s when I go, ‘Yum, that’s good. Stop,’” she said. Kara is looser in her cooking style. “We’ll make spaghetti sauce – Kara will throw everything in there and see how it turns out. I record everything and measure it out, so next time I know, ‘I need to tweak this by this much,’” Mark said. Spice worldThe transplants from America’s Dairyland cook dishes like pork fried rice, curries and otherworldly dishes in their personal kitchen, breaking the cheese curd and “dontcha know” stereotypes of their Great Lake home state. “In Wisconsin, ketchup is hot sauce,” Mark said. Cooking at home is what helped Mark create the sauces and spice blends sold through Durango Artisan Foods. His mixes, such as the taco mix and Hungarian goulash, come with specific recipes to follow. The pre-mixed blends make the cooking process simple, especially for more intricate dishes. “If you are going to actually make curry for yourself from scratch, you would need 15 to 20 different spices,” Mark said. And good luck finding fenugreek seeds anywhere in Durango. Kara said the guacamole mix is their best seller. “Ninety-nine out of 100 people – and that’s almost scientific – like guacamole,” Mark said. Mark and Kara Grubis both have backgrounds in aerospace engineering – Kara still works in the industry full time. They say their scientific approach to cooking comes in handy when designing new recipes. Mark developed some eclectic blends as well, such as the rogan josh, a complex Indian curry dish made with garam masala and madras curry. “It’s incredibly tasty and almost nobody knows what it is,” Mark said. The savory, aromatic dish was another example of flavors they couldn’t find at home. “We recognize some things that we do are not mass-market appeal. They are definitely niche,” Mark said. High Country HottieThe rock climbing, firefighting, snowboarding High Country Hottie and High Country Hero mascot babes on Durango Artisan Foods’ labels most likely wouldn’t be intimidated by rogan josh. Another savvy woman was behind Mark and Kara’s Mountain Man DIY Spicy Brown Mustard Kit – Mark’s mother-in-law. “He was like, ‘I can make the perfect mustard cold, but I can’t make it legal for the FDA,’” Kara said. It would have to be thermally processed to be bottled as a sauce, but that process changed the flavor. Kara’s mom suggested selling the mustard as a kit to get around it. The jar has all the spices in it, so the buyer has to add honey, water and vinegar, stick it in the fridge for two days and voila. Ska connectionMark has dabbled in sweeter mustards, too. He was commissioned by Ska Brewing Co. to make a special-edition mustard to go with some pretzels in the swag bag for a VIP party hosted before the brewery’s 23rd anniversary. He had a connection to Matt Vincent, founder of Ska Fabricating, through some independent consulting work for the company. The end result was Ska True Blonde Honey Mustard, made with the brewery’s crisp ale. 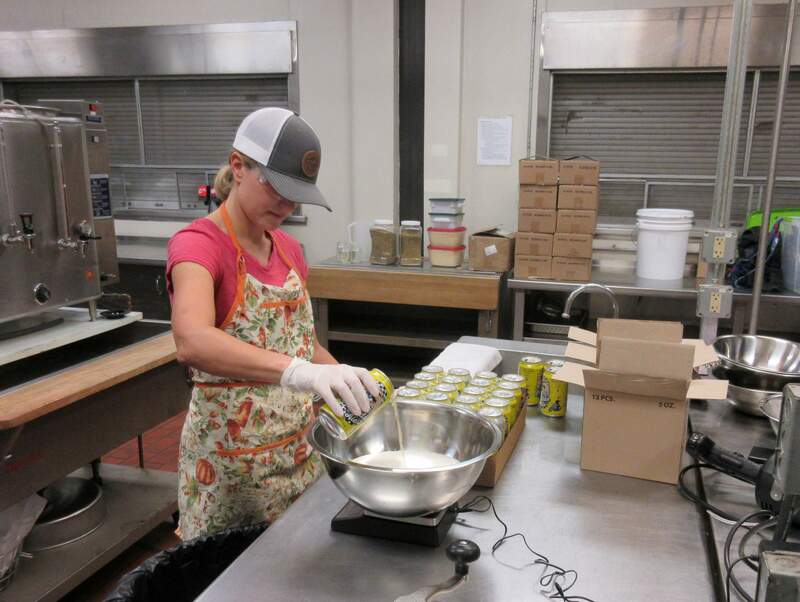 Kara Grubis weighs bowls of Ska Brewing Co.’s True Blond Ale for use in a recipe. The couple has partnered with the brewery to create a series of products made with Ska’s beers. Mark and Kara are open to making custom sauces for restaurants or anyone who wants them. They have a long list of ideas of what to make next: salsas, barbecue sauce, marinades, more spices, a Bloody Mary mix – they even joked about making self-defense products. “One of the first times Mark was cleaning (a bottling machine), he managed to aerate the pepper. It was like the entire kitchen got pepper-sprayed,” Kara said. Their watering eyes were burning. “We literally just pepper-sprayed ourselves,” Mark said. Durango Artisan Foods’ products can be purchased at durangoartisanfoods.com.